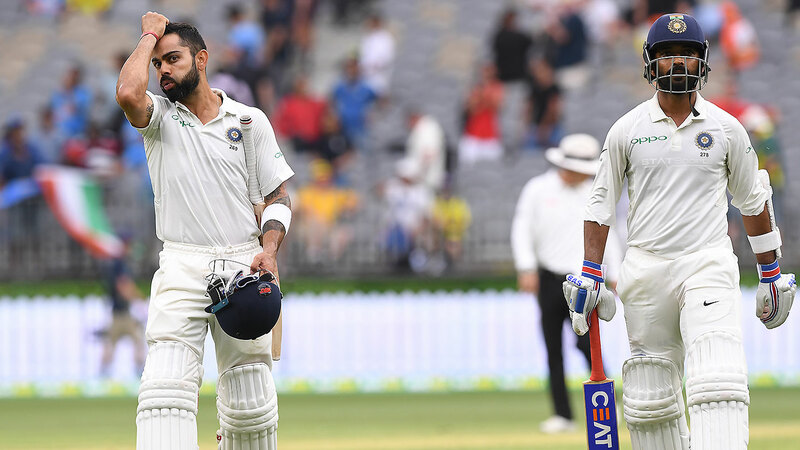 India captain Virat Kohli has come to the rescue for the tourists after Australia's pace attack couldn't capitalise on it's early dominance on day two of the second Test in Perth. Kohli finished the day unbeaten on 82 with India ending the day's play on 3/172, 154 runs behind Australia's first innings score of 326. Kohli played some glorious strokes early to get the scoreboard ticking over, scoring 19 off his first 12 balls to hold off the pressure Australia had applied. 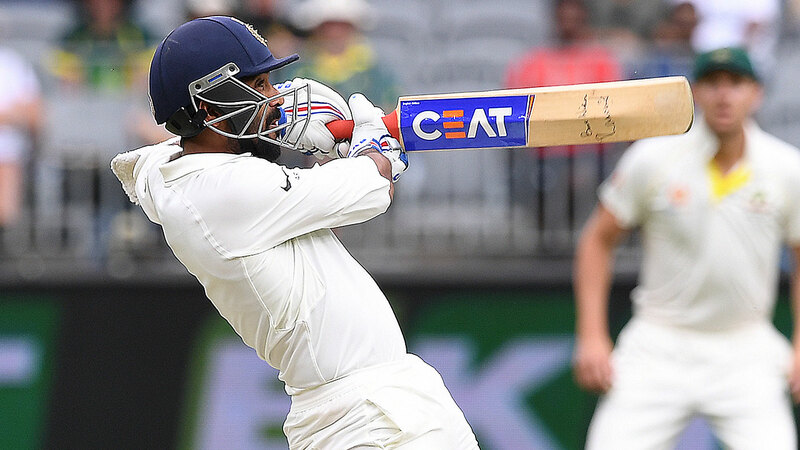 The number one ranked Test batsman showcased his class and was ably assisted by Ajinkya Rahane who launched a vicious counter-attack in the final session en-route to an unbeaten half-century of his own. Rahane was welcomed to the crease by a barrage of short-pitched deliveries from Australia's quicks, but fought fire with fire in an incredible turnaround from Australia's early dominance. Kohli was tested by none other than spinner Nathan Lyon on 22, when he nearly fell a big-spinning Lyon delivery that only just missed his stumps. But all in all, Kohli looked in control, combining with Cheteshwar Pujara to drag India out of trouble with a 74-run stand. A wicketless opening hour helped the hosts, who resumed on Saturday at 6-277, to post a first-innings total of 326 in Perth. Mitchell Starc blew apart the stumps to dismiss Murali Vijay for a duck, while a beautiful yorker by Josh Hazlewood after the meal bowled KL Rahul. India were in real trouble at 2-8 but Kohli and Pujara, played patient cricket and kept their team in the game at a pivotal time. Australia's bowlers were impressive in the session just after lunch, ensuring there wasn't a single boundary in 21 consecutive overs but they failed to break down Kohli and Pujara. Earlier, Paine and Pat Cummins pushed Australia's Test team past 300 for just the second time since the Cape Town cheating scandal. Paine led from the front, combining a few well-timed boundaries and cheeky singles in his knock of 38, but the skipper was part of collapse of 4-16 that ended the innings.